DETOX ….The Master Cleanse it is! We all know how I feel about Food; I love eating it, I love cooking it, and I love shopping for it. Food is a big staple in my life as I am sure in most people’s lives. However, lately I have been feeling kind of in a slump about it, I feel like I am so consumed with the many recent changes going on, with summer headed our way, the allergies I have due to the pollen and so on. So after much consideration I have decided that I will do the ‘Master Cleanse’ a combination of water, lemon, maple syrup and cayenne pepper. I have done this cleanse a few times already and it always makes me feel fantastic it gives me that extra energy I need during times when I am not feeling so great. The first time I did “The Master Cleanse” was back in 2005 everyone had said that I would not be able to go without food for 21 days and it kinda kicked something in me to prove them wrong. I had started to smoke in 2004 and went from hating smoke to smoking about a pack or more a day, I never had it in me to quit and didn’t even want to. So when I started the cleanse I hadn’t thought of the fact that I wouldn’t be able to smoke either. And, obviously after reading everything carefully and really soaking in the words “DETOX” I realized that I had embarked one tough journey. The first 3 days were torturous I had a horrible headaches from the caffeine withdrawal, I was craving my cigarettes, had muscle and body aches and I didn’t know if I would be able to complete it. However, although every single day I thought about quitting (sincerely only because I missed and craved the food), I started noticing how energetic and wonderful I was feeling, I would wake up in great moods, I had tons of energy (sexually as well, ha!) and felt like I was a new person; and the bonus was that I also lost a few lbs. When I got off the cleanse I had no desire to put a cigarette in my mouth and felt so great. It was a way for me to push the button and start anew. I felt fantastic. I have consistently done the cleanse just about once a year, right when I start feeling sluggish and not so great, with the weather changes and my not so inspirational mood I know that I need to reset myself and this seems to work fantastic for me. Prior to your first day on The Lemonade Diet you should have taken your Nightly Laxative. On your first full day you do not need to do the SWF so you can start drinking your Lemonade immediately upon waking. Little tip: Roll each lemon firmly between your palm and the counter. Put sufficient downward pressure as you rock the lemon back and forth under your hand. You are softening the lemon to make the extraction of juice more efficient. How much Lemonade should you drink during the day? You will drink between 6 and 12 glasses of Lemonade each day (some people drink as much as 26 glasses per day). The more you can drink, the better. I try to drink at least 8 glasses each day. This will depend on how big or small you currently are (caloric needs), your tolerance to physical and psychological urges to eat, and your desire to to lose weight. Sometimes a Muffin is just what you need. I made these for my brother, he was at the hospital for a few days and although the food they serve at hospitals here in Italy is delicious (strangely), the breakfast was not, it was the typical breakfast cookie or fette biscottate, which is a very common thing here in Italy to eat for breakfast, they are kind of like a mix of a toast and a cracker. However, not such a good breakfast option. I decided that I would go home and bake him something delicious and mostly healthy so that he wouldn’t have to skip breakfast. We are not a breakfast family really, besides the coffee, milk or tea; my Mother never really cared for breakfast, and barely any of my siblings care for breakfast either. We do eat something but not as soon as out of bed 1 or 2 hours may pass before we decide to eat something. So, of course with the stuff that they were serving at the hospital he would’ve skipped breakfast so in order for that not to happen I decided to bake muffins, that and also I thought that instead of bringing flowers, muffins would be a better option for a male. HA! I gave 2 to my Husband and the rest to my Brother and they both seemed to really enjoy them, so here I am posting them so that you can enjoy them as well. Enjoy! Preheat your oven at 350°. Grease and flour whatever size muffin pan you decided to use. Mix together 1 1/2 cups of flour, baking powder and salt into a bowl. In a larger bowl mix together yogurt, 1 cup of sugar, vanilla, lemon zest, eggs and the oil. Slowly add your dry ingredients to your wet ingredients and mix until completely incorporated. Pour batter into the prepared pan and sprinkle evenly on top of each one your sliced almonds and sugar. Bake for about 40 minutes or until cake tester comes out clean. Cooking times may vary from oven to oven so make sure to check on it. One of my favorite all time healthy, Low fat and Low Calorie Meals is the classic chicken and vegetables. I personally love asparagus so whenever in season they are always on my dish. The other thing that I love is to use the grill as much as possible it keeps the meal low fat but with amazing flavor. My Husband is the one that grills he loves it and I love the fact of cooking together. It’s like our little time together and it makes us enjoy each other more. Most of the time it’s me cooking and him just waiting around pouring the wine, trying his best to stay out of the way; but when we do cook together it’s both of us doing the work and we both compliment each other in the part that the other one cooked. It’s nice and I particularly appreciate his help and enjoy the fun moments that come from it. My husbands favorite meat is Chicken, he could honestly eat chicken about everyday or every other day so as soon as grilling season comes along (or even way before), we are definitely grilling chicken breasts. Accompanied generally by a vegetable and quinoa or cous-cous. 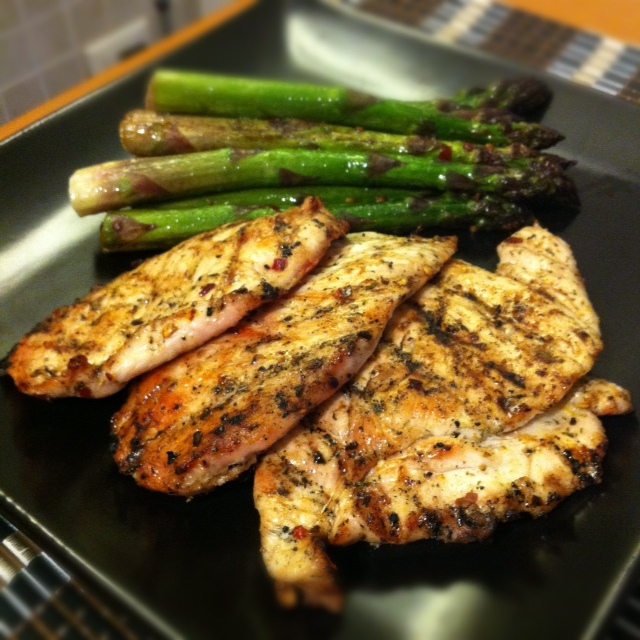 The other night we had the delicious grilled chicken breasts with asparagus and it was so good I thought that I should share the simple recipe with you. Enjoy! Turn on your grill and let heat. Get your chicken and drizzle 1 tbsp. of olive oil on it, along with the rosemary, salt and pepper. Mix together and let sit. Get your asparagus and wash, put it in a large saucepan over medium heat and drizzle remaining 1 tbsp. olive oil cover and allow to steam stirring occasionally; add salt and pepper to taste after about 5 minutes and cover. Should take about 15 minutes to be completely cooked.